Meet Your Neighbor Roby May, a new resident of the La Harpe Nursing Home. Roby is formerly from Dallas City and was born in Humphreys, Missouri, on August 5, 1920. During high school Roby worked at a grocery store in Humphreys. He recalled the story of a man and his wife coming into town with their team of horses and wagon selling their eggs and cream. He got the pleasure of waiting on them each month. Roby graduated high school from Humphrey High in 1938. "I was the only boy in a class of 15 girls." After high school he graduated from Chillicothe Business College. In May of 1942, he married Mary Virginia Evans. He and his wife raised four children, Sherry Gittings, Lois Evans, Randy May and David May. He has nine grandchildren and one great-grandchild. His family moved to Nauvoo in 1965 where he worked as a farm hand for several years then moved to Dallas City and went to work for General Electric in Burlington, Iowa. He retired after 25 years. 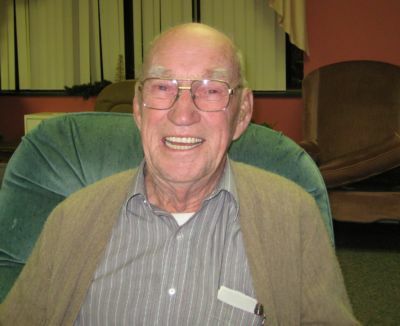 Roby's hobbies, before moving to the nursing home, was re-yarning lawn chairs and hunting. He enjoys visits from his family and the activities at the nursing home.